Basically, I threw out the idea of making nice even rows of perfect stitches. Why not let some of the chaos that surrounds our lives come out in the needle. I know there is an instant left-brain reaction not to like it, but you can’t help looking extra, trying to find the patterns. I just stitched, I stitched right over other stitches if they were in the way. I really like the layering in any case. It’s complicated and sometimes hard to see what’s underneath. Ok, maybe I am reading a lot in, but I just couldn’t be “neat” with this one. 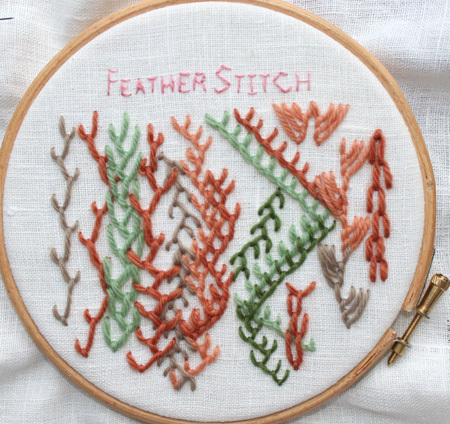 nice examples on your feather stitches…I use a fat yarn often too…I like the big french knots it makes:) Happy Weekend to you…. Very nice sampler! The layering looks very nice, adds depth to the embroidery. I like how you used a mix of colours for the beaded variations, makes it look so playful. Like your 'chaos' feather stitches.